In 2014-15, environmental watering triggered the breeding of Macquarie perch in the Yarra River for a second successive year. With a large volume of environmental water available for the Yarra River in 2014–15, the focus was on providing water for breeding for Macquarie perch and Australian grayling, along with providing habitat and maintaining water quality throughout summer. Helen Clarke, Environmental Water Resources Officer at Melbourne Water, said monitoring results from 2014–15 demonstrated a second successive year of strong recruitment for the river's Macquarie perch population. 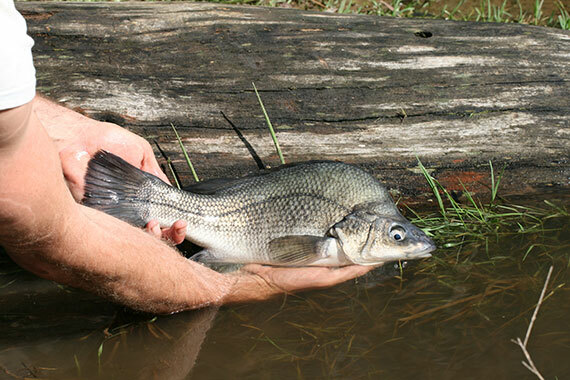 "Macquarie perch live for a relatively long time, which has contributed to the resilience of the species," Helen said. "Anecdotal evidence from our monitoring activities also indicates an increasing number of native fish generally within the system." Helen said Australian grayling spawning and migration monitoring from 2013–14 yielded results that are helping with the management of environmental water in the Yarra system. "Spawning monitoring on the Yarra collected higher numbers of eggs than previous surveys, improving our understanding of the spawning flows required in the system," she said. "Melbourne Water has also commenced a research project aiming to determine what influences Australian grayling to migrate back into freshwater systems from coastal systems. This work has shown promising results and will continue in 2015–16." Real-time water quality monitoring of the lower sections of the river also demonstrated the water quality benefits of summer fresh releases, including improved dissolved oxygen concentrations.